Hello and welcome to the 424th installment of the SWD. Unknown gunmen on a motorcycle opened fire on a Hayat Tahrir al-Sham’s checkpoint near the village of Kafr Karmin, west of Aleppo. Two elements of Hayat Tahrir al-Sham were wounded in the encounter. Islamic State’s elements escaped from a Jabhat Tahrir Suriya’s prison in the city of Binnish. Jabhat Tahrir Suriya was able to arrest seven elements, while 28 elements are still missing and are reported to be heading towards Sarmin, in order to join Ansar al-Tahwid, which was formed by the remnants of Jund al-Aqsa. Improvised explosive device targeted a civilian vehicle on the road between Armanaz and Al-Birah, northwest of Idlib. The explosion killed one and wounded one civilian. Fifth batch of rebel elements and their families were evacuated from the Northern Homs pocket and arrived at Qalaat al-Madiq crossing in western Hama. The batch reportedly consisted of around 3700 rebel elements and civilians, who will be transferred to camps for internally displaced persons in Aleppo and Idlib governorates. Liwa Thuwar Jobar wa al-Ghouta officially announced that the faction joined the Free Syrian Army’s Jaysh al-Izza. The announcement was made by Liwa Thuwar Jobar wa al-Ghouta’s leader, Abu Maher Aswad. Liwa Thuwar Jobar wa al-Ghouta reportedly consists of around 100 fighters. Abu Maher Aswad was previously affiliated with Faylaq al-Rahman in the East Ghouta and was considered one of the most prominent commanders of the group. Aswad used to operate on Jobar front in the East Ghouta, as well as lead Faylaq al-Rahman’s Al-Liwa 120, which consisted of around 800 fighters then. Turkish Armed Forces’ convoy entered Syria through Kafr Lusin and headed towards Jabal Shahshabo area in western Hama, in order to establish an observation point. The convoy was escorted by Faylaq al-Sham, Jaysh al-Izza, Jaysh al-Nasr, Jaysh al-Nukhba, and Ahrar al-Sham. Sixth batch of rebel elements and their families started evacuating from the Northern Homs pocket, towards northern Syria. Syrian Arab News Agency stated that more than 72 buses carrying fighters and civilians left the aforementioned localities towards northern Syria. 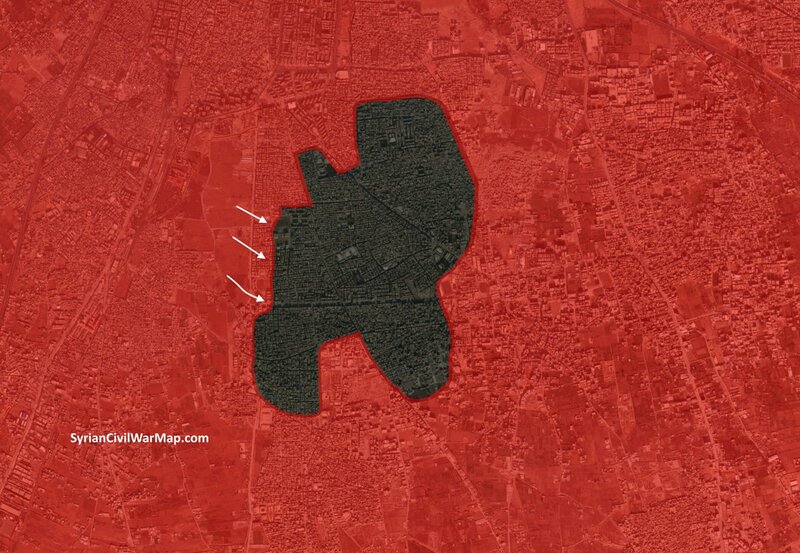 Syrian Arab News Agency also stated that 73 buses in total left the Northern Homs pocket yesterday. Syrian Arab Army and allies captured Al-Quds mosque in Al-Yarmouk camp from the Islamic State. 13 Free Syrian Army’s factions formed Sayuf al-Haq operations room in Quneitra governorate. Leader of the operations room is Abu Hassan Ghadir. According to Ghadir, the operations room will man frontlines with the Islamic State-affiliated Jaysh Khalid ibn al-Walid, preserve security in the governorate, and hunt sleeper cells affiliated with the Syrian government and Hezbollah. The newly-formed operations room consists of; Suqour al-Jabliyah, Liwa Muadh ibn Jabal, Tajammu al-Ahrar, Liwa al-Khansaa, Liwa al-Omrin, Liwa Shuhada al-Maelaqa, Katibat Aswad al-Harmin, Liwa Shuhada al-Quneitra wa al-Joulan, Liwa Badr al-Islam, Ahrar al-Joulan, Liwa Shuhada Nafiea, Liwa Ahrar al-Joulan, and Liwa Shuhada al-Ghadir. Islamic Emirate of Afghanistan (Taliban) stormed an Afghan National Army’s checkpoint in Ghalbyan area of Gurziwan district. Two elements of the Afghan National Army were killed and eight wounded, while an element of the Islamic Emirate of Afghanistan was killed and two wounded in the encounter. Afghan National Army’s element defected to the Islamic Emirate of Afghanistan in Yaka Bagh area of Qaysar district. Afghan National Security Forces killed five and wounded three elements of the Islamic Emirate of Afghanistan, as well as found and defused an improvised explosive device in Chahar Bolak district. Afghan National Security Forces killed seven and wounded four elements of the Islamic Emirate of Afghanistan, as well as destroyed a vehicle and several weapons depots and ammunition caches in the province. Afghan National Security Forces killed three elements of the Islamic State and destroyed a base in Deh Bala (Haska Meyna) district. Islamic Emirate of Afghanistan’s improvised explosive device destroyed an Afghan National Police’s vehicle in the city of Jalalabad, capital of Nangarhar Province. Five elements of the Afghan National Police were killed and three wounded by the explosion. Islamic Emirate of Afghanistan overran and destroyed an Afghan National Army’s post in Saydabad district. Six elements of the Afghan National Army were killed in the encounter. Islamic Emirate of Afghanistan seized an assault rifle and two PK machine guns from the post. Islamic Emirate of Afghanistan seized three Afghan National Army’s posts in Charkh district, killing ten soldiers in the process. Islamic Emirate of Afghanistan killed three and arrested four elements of the Islamic Emirate of Afghanistan, as well as destroyed a vehicle in the province. Islamic Emirate of Afghanistan attacked two Afghan National Army’s convoys in Zurmat district. Five elements of the Afghan National Army were killed, three wounded and an armored vehicle destroyed in the attacks. Islamic Emirate of Afghanistan ambushed Afghan Local Police’s elements in Sayid Karam district, killing three and wounding one element in the process. Islamic Emirate of Afghanistan’s improvised explosive device destroyed an Afghan National Army’s armored vehicle, as well as killed two and wounded one soldier in Joy Kar area of Murghab district. Residents of Qadis Khardak Sharqi area in Qadis district pledged their allegiance to the Islamic Emirate of Afghanistan. The aforementioned area contains more than 10000 families, under the leadership of 15 commanders. Besides the 15 aforementioned commanders, additional 500 elements of the Afghan National Police and Afghan Local Police present in the area defected to the Islamic Emirate of Afghanistan. The defected elements handed over a pickup, 22 PK machine guns, and ten RPG launchers to the Islamic Emirate of Afghanistan. Afghan National Security Forces wounded five elements of the Islamic Emirate of Afghanistan in Shindand district. Islamic Emirate of Afghanistan ambushed a group of Afghan Local Police’s elements in Salum area of Pashtun Zarghun district. Two elements of the Afghan Local Police were killed in the ambush and their assault rifles seized by the Islamic Emirate of Afghanistan. Similarly, an element of the Afghan Local Police was ambushed and killed in Pay Kohs Kapa area of Shindand district. Afghan National Security Forces killed two elements of the Islamic Emirate of Afghanistan in Taywara district. Islamic Emirate of Afghanistan overran an Afghan National Army’s checkpoint in Band Bor area of Dawlat Yar district, as well as overran Masjid Negar area of Shahrak district. Afghan National Security Forces withdrew from 30 villages in Dawlat Yar district and the Islamic Emirate of Afghanistan entered the villages after the withdrawal. The villages are reportedly inhabited by around 12000 families. After the Islamic Emirate of Afghanistan entered the villages, roads to six district of Ghor Province were completely blocked off. Ten elements of the Afghan Local Police defected to the Islamic Emirate of Afghanistan in Khawja area of Dawlat Yar district. Afghan National Security Forces killed five and wounded five elements of the Islamic Emirate of Afghanistan, as well as destroyed several weapons depots and ammunition caches in Andar district. Islamic Emirate of Afghanistan killed seven and wounded three elements of the Afghan National Army, as well as destroyed three armored vehicles and a vehicle in Andar district. Afghan Ministry of Defense stated that the Afghan National Security Forces re-opened highway between Ghazni and Paktika provinces. Islamic Emirate of Afghanistan seized an Afghan National Police’s post in the city of Ghazni, killing two and wounding several policemen in the process. Islamic Emirate of Afghanistan also engaged Afghan National Police’s reinforcements arriving at the post, killing three and wounding two elements, as well as destroying an armored vehicle. One element of the Islamic Emirate of Afghanistan was killed in the encounter. Islamic Emirate of Afghanistan seized an Afghan Local Police’s post in Qarabagh district, killing three and wounding a dozen of policemen. Islamic Emirate of Afghanistan seized a vehicle, two motorcycles, a PK machine gun, and three assault rifles from the post. Islamic Emirate of Afghanistan attacked an Afghan National Army’s base in Sakhi Ghondi area and army’s positions in Garm Ab area of Khas Urozgan. Islamic Emirate of Afghanistan’s Al-Emarah News stated that more than 20 elements of the Afghan National Army were killed and additional 12 arrested, as the group overran two bases and two checkpoints in the aforementioned areas. Two elements of the Islamic Emirate of Afghanistan were killed and two wounded in the encounters. Islamic Emirate of Afghanistan seized 22 assault rifles, five PK machine guns, two sniper rifles, a DShK heavy machine gun, and large quantities of ammunition from the captured bases and checkpoints. Islamic Emirate of Afghanistan overran three Afghan National Security Forces’ posts in Arghandab district. Islamic Emirate of Afghanistan’s Al-Emarah News claimed that more than 50 elements of the Afghan National Security Forces were killed and wounded in the encounters. Afghan Local Police’s commander of Shinkay district, Sultan Muhammad is one of the killed elements. Islamic Emirate of Afghanistan’s sniper killed an element of the Afghan National Army in Speni Ghbargi area of Qalat district. Islamic Emirate of Afghanistan attacked an Afghan National Security Forces’ Ghondi Post checkpoint in Khash Rod district. Eight elements of the Afghan National Security Forces were killed and ten wounded, as well as two armored personnel carriers and a bulldozer destroyed, while an element of the Islamic Emirate of Afghanistan was killed in the encounter. Afghan National Security Forces killed five, wounded four, and arrested two elements of the Islamic Emirate of Afghanistan in Sangin and Jerashk districts. Islamic Emirate of Afghanistan’s snipers killed four elements of the Afghan National Army and an element of the Afghan National Police in Sangin and Jerashk districts. Islamic Emirate of Afghanistan attacked an Afghan National Police’s checkpoint in Khasar Abad area of Nawa-I-Barakzayi districts. Five elements of the Afghan National Police were killed and an armored personnel carrier and a pickup destroyed, while an element of the Islamic Emirate of Afghanistan was wounded in the encounter. Islamic Emirate of Afghanistan’s improvised explosive device destroyed an Afghan National Army’s armored vehicle in Abdul Rahman area of Dand district. Similarly, an Islamic Emirate of Afghanistan’s improvised explosive device destroyed an Afghan National Army’s armored personnel carrier in Wam area of Arghistan district. Islamic Emirate of Afghanistan’s sniper killed two elements of the Afghan National Army in Chinar area of Khakrez district.